"I'll see you at our Human Resources. Bring your Union Rep with you." Those were the words of this particular manager in a hospital where a dear friend of mine has been working for over 10 years. Not because I am her friend that's why I'm defending her, but it's even harder that I'm her friend yet I can't do anything to help her out except to lift her up in my prayers. Being a nurse like her, I knew in my heart that she didn't do anything wrong and that she saved someone's life. That's our job is to be an advocate for our patients, even if our actions will be against doctors' orders, in order for us to protect the patients' health status and provide them a safe, nurturing environment. Last month, there was a patient with subarachnoid bleeding [bleeding in the brain]. His blood pressure started going higher and he constantly complained of unrelieved headache. The neurosurgeon had an order the day before to discharge this patient that morning, when Anna [my friend] took over from the night shift nurse to care for this patient. She immediately called the Pain Team and had asked to evaluate the patient's need for pain relief. When the patient's pain subsided, she placed one phone call after another to the neurosurgeon's answering service [3x at least] to make him aware about the patient's change in his health status. But the doctor never called her back. The last time that she called, the answering service told her to hold the patient's discharge until the doctor was able to call her back. With everything that had occurred, Anna wrote it in her nurse's notes. She had written an order for the doctor [which the doctor can sign later] to hold the patient's discharge. When the other [medical] doctor came, he was the one who ordered for a CT scan [special x-ray that shows better results than an ordinary x-ray]. The result showed that the patient continued to bleed. That explained why he was having headache still. The neurosurgeon showed up the following day, upset and wanted to know who the nurse was because within the nurse's scope of care, nurses can't write an order for the doctor without talking to them. The nurse manager added to this building up emotional displeasure [I say this was an "ego at its best!"]. The nurse manager decided to bring Anna to Human Resources because she felt that she violated that scope of care. I could see if Anna had written an order for a medication that was lethal or some intervention that hurt the patient. She actually saved the patient's life and actually saved that doctor's improper lack of care as he hasn't responded to the calls placed to his answering service at a time when the patient was undergoing a change in his status. The patient ended up being hospitalized for a few more days. The whole time, the nurse manager told her bigger boss about Anna "writing the order without the doctor's knowledge" but didn't really give the whole picture of what precipitated her action. Despite all the mixed emotions of fear, confusion, being angry about an accusation that has no basis at all, and feeling harassed, I knew that God would protect her when we started praying together and to God's hands, she placed all those emotions. Nothing happened when her manager brought her to Human Resources. She was telling me that though it was expected that the Management would not say anything against their managers, they had a look like this case should not have been brought up to their desk. There are so many injustices in this world. 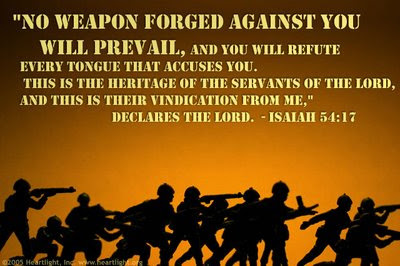 Even us, as Christians, sometimes, we wish for a quick judgment and destruction on wicked people. We forget that God is always merciful, slow to anger, always with unfailing love. He is just. "Jonah got upset when the people of Nineveh came into mourning and repentance when he warned them, as he was sent by the Lord for He wanted this "great city" to be saved. He was so upset that he went to the east side of the city and made a shelter to sit under and waited to see if anything would happen to Nineveh and its people." God made a leafy plant to grow to protect him from the heat of the sun. The next day, He prepared a worm that ate the stem so the plant died and Jonah grew faint and wished to die when the sun got so hot. "Death is better than this!," exclaimed Jonah. When God asked him if it was right for him to be angry because the plant died, Jonah replied, "Yes, even angry enough to die." The Lord said, "You feel sorry about the plant, though you did nothing to put it there. And a plant is only, at best, short lived. But Nineveh has more than 120,000 people living in spiritual darkness, not to mention all the animals. Shouldn't I feel sorry for such a great city?" [Jonah 4:1-10; Life Application Bible]. I wrote this song on 8/7/03. As I got transferred from one detention center to another one. I felt heavy because I didn't want to get out of my comfort zone. Until I let go and "let God..."
Lord, how can I go on? Without backing out on my own? Are you like me, who started blogging and was not really sure why but just to do something for the Lord? Hoping that many who don't know Who "Jesus Christ" is, will happen to read your blog and know more about His love and gift of salvation? Little did I know, aside from that purpose, I didn't have a clue that I would get to meet a lot of brothers and sisters in Christ in a very short amount of time. Through that brotherhood, sisterhood unity, I just got more inspired in doing what I wanted to do for the Lord. I just felt that "kind of unity" that comes from the Lord and how blessed I am right now to have that opportunity to know a lot of you. 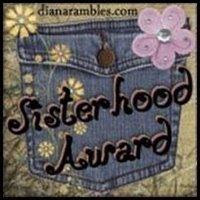 The other day, sister Alleluiabelle had passed on this "Sisterhood Award.". Thank you sister Alleluiabelle for sharing that with me. It's not so much about receiving recognitions and awards, but it's the love that you feel when you receive those that came with it that truly touches me. If you haven't gone by sister Alleluiabelle's blog site, please do so. You will be encouraged by her writing because you will feel her humble spirit who is after God in all of her ways. Colossians 3:14 -"And over all these virtues put on love, which binds them all together in perfect unity." God's blessings work by us, sharing it with others, instead of keeping it to ourselves. I would like to share this award with you ["sorry guys! :)]..., if you're reading this site now. That's what I feel...is that I love you all with the love that comes from the Lord. It's a pleasure to meet you and know that we are One in Spirit! God bless all of you! ["If I could speak in any language in heaven or on earth but didn't love others, I would only be making meaningless noise like a loud gong or a clanging cymbal. If I had the gift of prophecy and if I knew all the mysteries of the future and knew everything about everything, but didn't love others, what good would I be? And if I had the gift of faith so that I could speak to a mountain an dmake it move, without love I would be no good to anybody. If I gave everything I have to the poor and even sacrificed my body, I could boast about it but if I didn't love others, I would be of no value whatsoever..." -1Corinthians 13:1-3; Life Application Bible].